We had left Stovepipe Wells the evening before in darkness, as the electricity was out. Sometime during the night Claudia noticed that the lights seemed brighter toward Stovepipe Wells, so we hoped the power had been restored. When we got back around 8:30 a.m. the power was indeed back on – yay! California Edison had brought in two generators. However they weren’t serving breakfast, as they hadn’t yet been resupplied with food. No one in our hungry and tired group wanted to make the hour-long roundtrip drive down to Furnace Creek for breakfast, so we pooled our resources and shared whatever food we had on hand, which turned out to be plenty. Then we crashed in our now thankfully air-conditioned rooms. Both nights were beautiful – serene and quiet, with a million stars overhead. As far as I could tell we were the only people out in the dunes after dark. They were unforgettable experiences, made even more special because we shared them with a wonderful group of people. 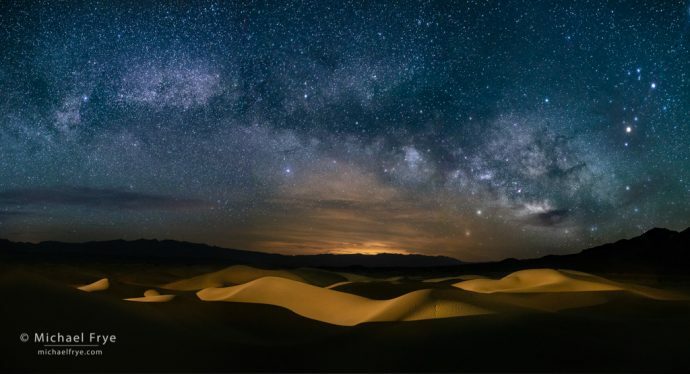 Sand dune at night, Death Valley. 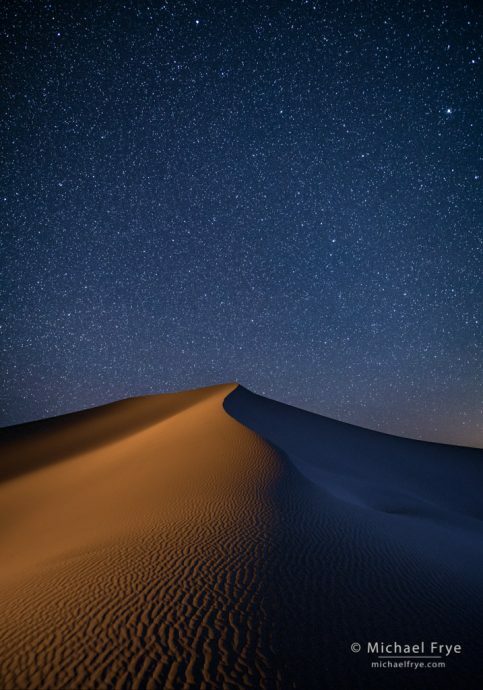 I made this image our first night, and it’s a blend of three separate frames (though the camera never moved) – one for lighting the dune from the left, one from the right, and one for the sky. The exposures varied, but the sky was 20 seconds at f/2.5, ISO 5000. 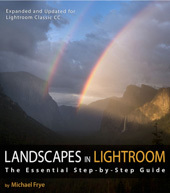 I use Photoshop for image blends like this, layering the images together and using the Lighten blending mode. 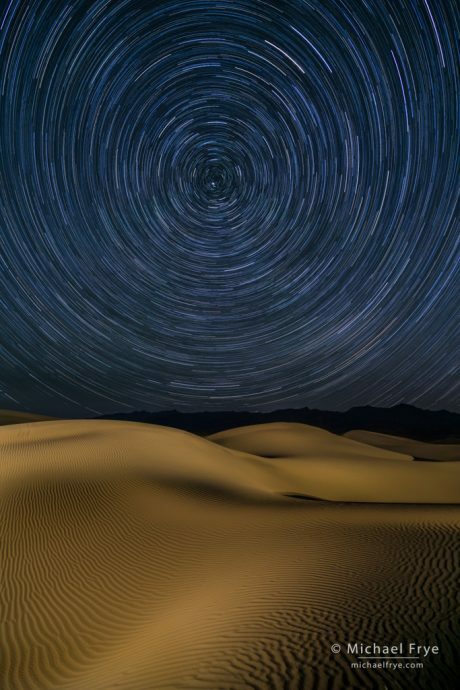 Star trails over the Mesquite Flat Dunes, Death Valley. We captured at least half a dozen light-painting frames for this star-trail photograph, but I used only three in the final image. Then there are 21 frames for the star trails, each four minutes at f/4, ISO 800. Again I used Photoshop to blend everything together. 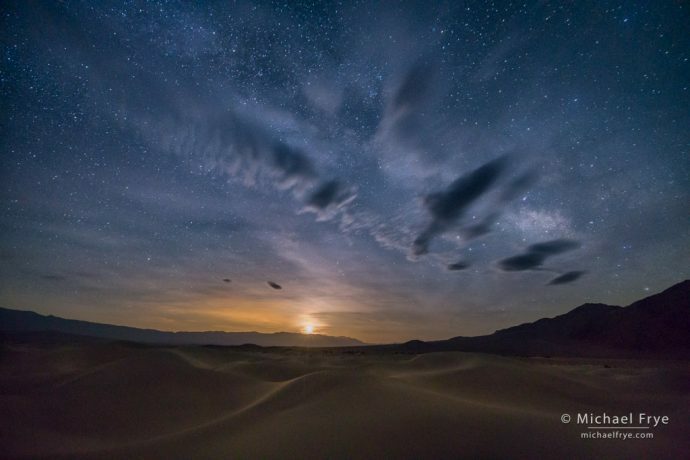 Moonrise from the Mesquite Flat Dunes, Death Valley. This was one exposure, 30 seconds at f/4, ISO 6400 – chosen to avoid blowing out the moon too much while still retaining some detail in the dunes. 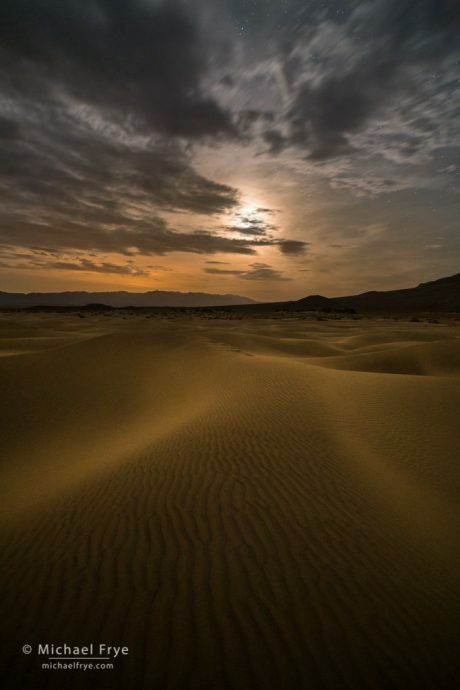 Moonlight on sand dunes, Death Valley. A blend of two exposures, one for the sky and one for the foreground. The sky was 20 seconds at f/4, ISO 2500, while the foreground was 20 seconds at f/2.8, ISO 5000. 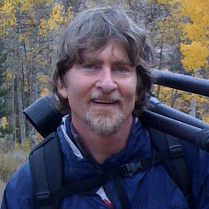 Your work is stunning, Michael Frye! Do you mind if I use the images for my computer desktop?